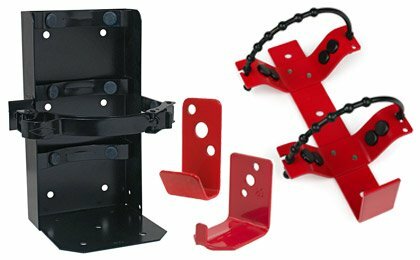 Fire Supply Depot stocks a wide variety of fire extinguisher wall mounting brackets and vehicle mounting brackets for commercial and residential use. According to OSHA, to prevent fire extinguishers from being moved or damaged, they should be mounted on brackets or in wall cabinets with the carrying handle placed 3-1/2 to 5 feet above the floor. Larger fire extinguishers need to be mounted at lower heights with the carrying handle about 3 feet from the floor. Our universal wall hangers and vehicle extinguisher brackets are quality manufactured of steel with a primed and powder coated paint finish.